Notes from Coode Street features Jonathan Strahan, Gary K. Wolfe, Andy Duncan and Karen Joy Fowler. Warners To Adapt John Tweleve Hawks’ Traveler. The Hunger Games Leads the Pack in a New Wave of Dystopia. New website dedicated to Philip José Farmer’s Khokarsa series, with never-before-published exclusives from Phil’s notes, hand-drawn maps& more. As part of the Fantastic Fiction free reading series, Ellen Datlow and Matthew Kressel present Caitlín R. Kiernan & Scott Lynch, Wednesday April 18th, 7pm at KGB Bar in NYC. Suvudu (John Hornor Jacobs) on Rationalizing the Zombie. 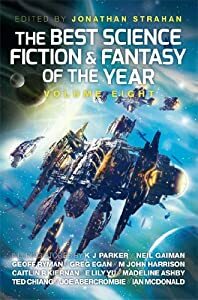 James Wallace Harris asks What is the Kindle Doing to the Science Fiction Genre? Nancy Kress on Florida — ICFA continues. Deborah J. Ross (J.M. Frey) on creating Triptych. Suvudu (Tricia Barr) on Stories from a Certain Point of View. Dan Abnett on Journal of the Monkey Years. @ItsArtMag: “Undead Dragon” by nocturnalcloud. @Tumbler: “Orbital Tower” by Mary. Vintage Ad for The Six Milllion Dollar Man Bionic Action Club.